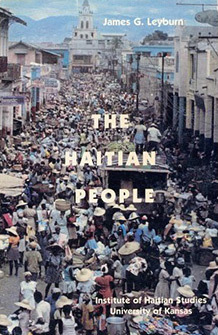 Leyburn provides a connected story of the growth of Haiti’s social institutions out of the backgrounds of slavery and French colonial life and the slow shaping of these institutions through the 19th century. The central thesis of the book is that Haitian society is divided into two segments, the yeomanry and the elite, and that the national institutional structure has not allowed any alteration in that division in the course of Haiti’s history as a sovereign nation. James G. Leyburn was a distinguished teacher, scholar, administrator, churchman, author, and mentor to generations of students at Washington and Lee University. A graduate of Trinity College (Duke), Princeton, and Yale Universities, Dr. Leyburn came to W&L from Yale in 1947 as Dean of the University. As Dean, he led the university to national prominence. In 1956 he turned to full-time teaching as head of the Department of Sociology. He taught with legendary energy and passion until his retirement in 1972.